Having trouble viewing this site? Try updating your browser to the latest version. Fly Fishing: Boobies at Nar Valley on Vimeo - Click Here. Vernon & Andy Parker fishing at Hobbs lake - Click Here. We are now recruiting new Troutfishing members for 2019 season so you can enjoy this lovely fishery from 1st January to 31st December. With your membership will come access to our superb mile and a half of the River Nar from 1st April to 31st October. Don't delay, contact Chris on 01553 636507 / 07900 285313 for applications or more information. Hobbs Lake is a former gravel pit of some twenty-five acres; The average depth is around 9 feet but can boast areas of nearly twenty feet to the bottom, great for cooler water in the summer. This lake is available on separate Trout fishing season permit to the Coarse fishery. Hobbs lake is stocked predominantly with Rainbow Trout which run to 12lb, and in addition a small head of quality Brown trout to 6lb completes the picture. Most of the margins are wadeable with safety and is a major advantage to many other similar fisheries. We have a boat on the lake for the members to use as they wish or members can their own boat at the lake. Fishing is from the bank or boat, or in the reedy margins via wooden stagings through to the deeper water. Throughout the year this lake boasts some incredible hatches which sometimes frustate the angler when 'matching the hatch' has to be so precise. If you enjoy fishing for trout then we encourage you to come along and try out Hobbs Lake. 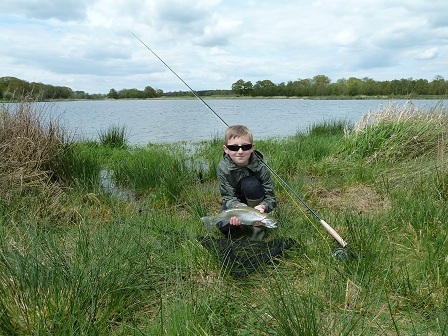 This fishery offers a fantastic days trout fishing. We can also include 1 1/2 miles of the River Nar on this permit. Our section of the River is the bottom end of the Trout phase so also includes Chub annd Dace. The Trout are mainly small natural Browns with a few Seatrout available at certin times of the year. The odd resident big Brown can also be located. This Autumn the Norfolk Rivers Trust will survey the habitat enhancement on our section they worked on three years ago to judge how well it has improved. From our catch reports we are confident they will be very pleased with the results. �50 PA charge for the use of the boat or mooring fee of own boat. In the image slideshow to the left you can see some of the residents of this fabulous fishery. 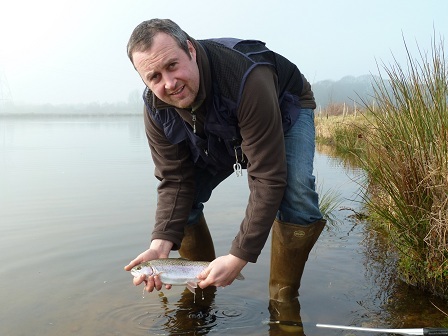 Rainbow Trout - Our stocking policy is to introduce fish in the 1.25lb to 2lb range to allow them to grow. With the catch and release policy the bigger fish tend to get caught readily, and it is certainly unusual to get a bag totally of recent stocked fish. So, the lake stock of Rainbows now range from 1 1/4lb stockies to 12lb specimens. The average size caught in 2018 was 3 1/2lb. Brown Trout - Each season we add a few more Browns to our stock; So a small head of Browns are now ranging from 1 1/2lb stockies to 6lb specimens. Hobbs Lake Trout Fishery has additional rules which are to be followed in parallel to the Nar Valley Fisheries membership rules. Wading is permitted in designated areas only; Anglers do so at their own risk. A maximum of three flies only per line. 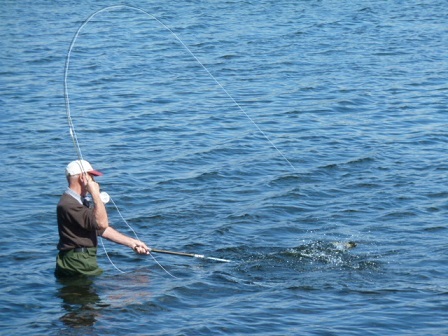 All flies design as bouyant or floating must be fished on a full floating line only. All catch-returns to be filled in accurately and left in the box in the lodge. No fires or braziers to be lit. All junior members to be accompanied by an adult member at all times. Do not handle fish unless absolutely necessary, make sure your hands are wet when handling fish. Use an unhooking tool or artery forceps to remove hook. Do not wander beyond designated fishing areas. Please keep noise and light to a minimum and have regard for other anglers. The keyholder is responsible for the boat and it�s safe, secure use. The boat may only be used in daylight hours. Only authorised persons may use the boat. Annual permit holders are only permitted to use the boat when invited as a guest of a boat permit holder. All persons in a boat will wear lifejackets or buoyancy aids at all times on the water. The boat must be inspected by the user prior to casting off. All faults or damage must be reported immediately to the fisheries manager or one of the NVF bailiffs. The use of the boat is at your own risk and on the understanding that Middleton Aggregates ltd and Gayton Road Fisheries accept no liability whatsoever for loss of life, damage, injury or loss to persons or property whilst on the site or using this equipment. Officially appointed bailiffs have the authority to suspend, expel or refuse admission to any person whose conduct is deemed detrimental to the interest of the fishery. Angler�s luggage, equipment and vehicles may be inspected at any time whilst on site. Anglers fishing do so on the understanding that Middleton Aggregates Ltd and Gayton Road Fisheries accept no liability whatsoever for loss of life, damage, injury or loss to persons or property whilst on site. FAILURE TO COMPLY WITH THESE RULES WILL RESULT IN IMMEDIATE FORFEITURE OF YOUR MEMBERSHIP TICKET WITHOUT REFUND.